The Privy Council Office says it offered the Tory leader details. Conservative Leader Andrew Scheer stands during question period on Parliament Hill in Ottawa on Feb. 28, 2018. OTTAWA — Conservative Leader Andrew Scheer suggested Friday that he doesn't want to know any government intelligence related to a former attempted murderer's presence on the prime minister's trip to India unless all members of Parliament receive the same information. As a former Speaker of the House of Commons, Scheer is a member of the Privy Council and can access top secret information not given to most MPs. Approximately 20 members of the Conservative caucus are privy councillors and could, technically, ask for a briefing. As HuffPost first reported Thursday, the Privy Council Office (PCO) says it offered Scheer a briefing on the prime minister's India trip but the Conservative leader disputes the claim. Stéphane Shank, the PCO manager of media relations, wrote in an email that "the Government of Canada did offer a briefing on India to Mr. Scheer." But Scheer told reporters in Toronto Friday that statement was "completely false." "Our indication was that the Prime Minister's Office was checking with their legal counsel to see if it would be possible and they were going to get back to us," he said. "The excuse that the government has right now, that [Prime Minister] Justin Trudeau has, is that he is not able to allow his national security advisor to brief members of Parliament because they are not in the Privy Council. That only privy councillors, people who have that secret clearance, are allowed to be briefed and yet [the national security adviser] briefed the media ... So it is a completely bogus argument," Scheer said. "I'd be happy to accept a briefing from the national security adviser on this issue as long as it includes members of Parliament," he added. Trudeau's office said it never approached the Tory leader's office. Scheer's spokesman told The Globe and Mail late Thursday evening that it was the clerk of Privy Council, the country's top civil servant, Michael Wernick, who approached the Tory leader. "In no way was a formal briefing ever offered to Mr. Scheer. The Clerk of the Privy Council indicated that he would confer with his legal council [sic] about the possibility. We indicated our interest and await a formal invitation," Enwright told reporter Laura Stone, according to a screengrab on Twitter. "Andrew is prepared to accept that briefing." 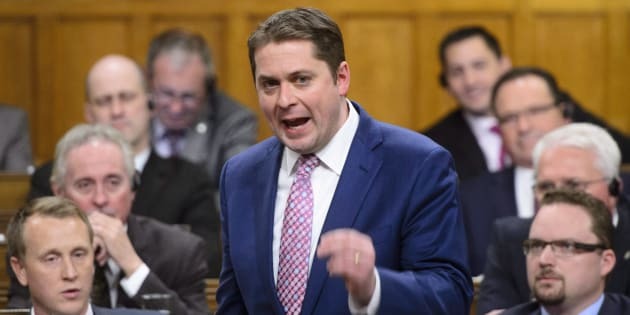 Five hours after that statement was posted on social media, however, Scheer entered the House of Commons and, rising on a point of order at 3:25 a.m., said he was only now learning through the media that he had been offered a briefing. Two government sources told HuffPost that a senior public servant — outed as Wernick — approached Scheer's chief of staff, David McArthur, last week and suggested he ask Conservative MP Tony Clement to brief Scheer on any information he may have. HuffPost was also told that senior public servant subsequently called McArthur on Thursday offering Scheer a briefing with public servants. McArthur has not responded to emails inquiring about Wernick's calls. "The leader was offered a briefing in a non-political way to say if you want the information, you can have the information," a source said. Clement is a member of the secretive National Security and Intelligence Committee of Parliamentarians (NSICOP). The committee is a creature of the executive branch and all its members are sworn to secrecy. Anything they learn cannot be shared with others publicly. Public Safety Minister Ralph Goodale previously told MPs that if they wanted to hear from Canada's national security adviser, Daniel Jean, NSICOP was the appropriate committee. Jean is the government official who told reporters in a not-for-attribution discussion that the presence of former Sikh separatist and convicted attempted murderer Jaspal Atwal at Canadian High Commission events in India had been arranged by factions within the Indian government. Jaspal Atwal arrives with his lawyer Rishi T. Gill for a news conference in downtown Vancouver, on March 8, 2018. Jean's comments came after British Columbia Liberal MP Randeep Sarai took responsibility for placing Atwal on the list of invitees. The national security adviser's words unleashed opposition criticism that the Trudeau government was hiding behind one of the country's top public servants to fix a politically disastrous trip. Those calls only rang louder as the government refused to allow Jean to testify publicly at the Commons' public safety committee — and again Thursday during an opposition motion calling on the national security adviser to appear for an hour — later amended to a maximum of 30 minutes— to offer MPs the same briefing he'd given the media. NDP MP Brian Masse, for example, said he found Trudeau's actions "completely disgusting." "The reality is what we have is one official that has been asked to testify, who is a senior bureaucratic administrative person, who is a big person, in the sense of that they are able to cope with these situations, and that is what they are paid to do and it's important for Canadians to have that accountability," he said. Sarai said he too had a "lot of questions" about what happened, but he offered the government some leeway. "On the information that the national security adviser has, it would be great for everyone to know, but I think there is some stuff that he may or may not be able to share with the general public and that I leave it to him," Sarai said. "I don't have that security clearance." Clement, the Tories' representative on NSICOP, told HuffPost on Thursday that he could not answers any questions regarding the committee and whether or not Jean had briefed its members. Some Liberals are frustrated by what they see as a Conservative "political stunt" orchestrated to present an incomplete image before the Canadian public. "If their stated goal is what they are saying out loud, then they would have accepted a briefing and gone into this with information...instead of choosing to stay in ignorance." Carleton University professor and former national security analyst Stephanie Carvin told Huffpost that the Conservatives are not wrong to point out that using Jean to massage a political problem was a terrible idea. But, she said, calling Jean to testify in a public forum would prevent him from defending himself properly. "Open parliamentary hearings are unclassified so he will be unable to defend himself using the full range of information available. In this sense, Parliament won't actually get the truth." Carvin noted how, in 2010, Richard Fadden, the then head of Canadian Security Intelligence Service (CSIS), was called to committee after telling the CBC that Chinese spies were infiltrating Canadian political circles. "Everyone went completely nuts. He was hauled in couldn't defend himself and the 'report' that was issued afterwards said he had hurt all Chinese Canadians and just stopped short of calling him racist. We now know what he was saying was almost certainly true," she said. Jean, Carvin suggested, could be heard from at the NSICOP or through an in-camera session of a Commons committee. Conservative House Leader Candice Bergen told reporters that she doesn't want MPs briefed in-camera because it would prevented them from talking to the public about it. The problem with having Jean only appear at the NSICOP is that any report on what what he might say would be "washed and cleansed" through Trudeau's office before going out to the public, she noted. "This is a cover up," she added, as she announced the end of a round-the-clock voting marathon Friday that the Tories engineered to draw attention to the issue. "Canadians should know that parliamentarians routinely come to committees," she said. MPs frequently hear from the heads of the CSIS and the RCMP, she said, on "numerous sensitive matters." "Yet, we are being denied access to this one official, in particular," Bergen said. "The Liberals have gone to great lengths to ensure that the information that Daniel Jean holds never sees the light of day."